The WA Police Force is giving you the chance to experience the most exciting, high-tech and specialised elements of policing at a free family event at the Joondalup Police Academy on Saturday 23 March. WA Police Force has adopted policies that provide a mechanism to recover costs associated with the deployment of police resources to major sporting and entertainment events in Western Australia. Information and advice specifically catering for diverse communities, people with disability, people of diverse sexuality and/or gender and seniors. Employees and immediate family members of the Western Australia Police Force rely on the support of their partners, children and other family members. Neighbourhood Watch is a program to help neighbours watch out for neighbours. 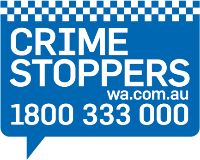 Eligible organisations are invited to apply for funding to implement community crime prevention projects. The Western Australia Police Force Pipe Band proudly serves the whole community of Western Australia and are the current Australian and South Pacific Grade 1 Champions. Community based programs for the community, businesses and local government. Here are some extra activities that you may wish to use with your classes when looking at the different topics within the Young People's Zone. Neighbours - everybody needs good neighbours! Auctions are held on site at the premises of Ross's Auctioneers & Valuers, 453 Orrong Road, Welshpool. Auctions are held during the week and weekends.